I’ve posted before that Netview uses the version of Internet Explorer installed on your system. It turns out that, as of IE8, it’s not quite that simple. Thanks to Luc-Eric for pointing this out. Netview is a hosted version of the Internet Explorer WebControl, and by default, the WebControl displays pages in IE7 Standards mode. I tested the registry entry, and after I set it, this browser detect page correctly said I was using IE9 (before I set the registry, it said I was using IE7). Also, after setting the registry entry, Netview scored 140 at http://html5test.com/ (before I set the registry, Netview scored 40). Note that IE9 itself scores 141. This entry was posted in Info, Tips by xsisupport. Bookmark the permalink. Great post, however, I receive script errors whenever Netview starts. Are you experiencing the same issues? I applied the MetaTab, but what if IE is not installed on the computer ? 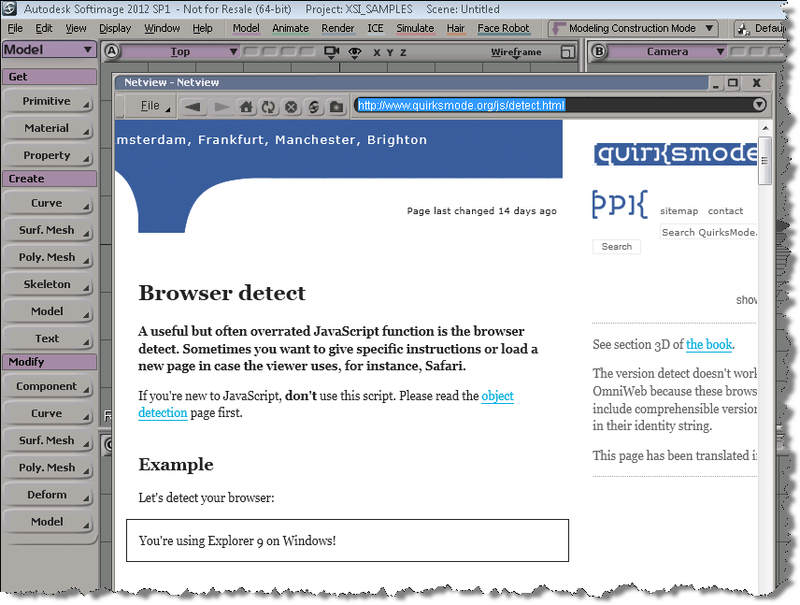 Netview is not showing the HTML5 document as it looks in a browser in Softimage 2013, unless I have to change the MetaTag to IE10, then it leads me back to the first question, what if IE10 is not installed on the computer. I’d like to post an image to compare how it looks in FireFox and Netview, I feel this post is abandoned !